The Ted I’m married to today isn’t the same Ted I married over 13 years ago. Sure, he has the same blue eyes. The same crazy hair worthy of his middle name Wolfgang. Yes, he still often stuns people with his dry, witty sense of humor. And, all these years later, his passion for soy sauce and politics (not necessarily in that order) remains rock solid. But he’s also changed over the years. He now eats leftovers instead of cereal for breakfast. He gets seriously excited to watch obscure black-and-white films like Crisis (all you Cary Grant fans out there may know that one). And, best of all, he now understands why adults go to Disney World … without their children. Although that one’s easier said than done. The thing is, he’ll tell you the same thing about me. The Ashleigh he’s married to today isn’t the same Ashleigh he married 13 years ago. I’ve changed too. I now crave sushi, put Texas Pete’s on my pizza, and eagerly watch dystopian-themed television shows and movies. Fortunately, our changes have brought us closer together. They’ve resulted in more points of connection. More shared interests. More mutual dreams. But I know that’s not always the case for couples. I’d venture to guess that you and your husband have also changed since that day you promised “I do.” Because the reality is that none of us is static. So as long as we’re living, we all change. Without exception. (God, the Changeless One, is the only one who’s the same yesterday, today, and forever.) Which means none of our relationships is static. They change too. Including our marriages. So if change is inevitable, how can we better embrace it in our husbands and ultimately in our marriages? I believe by being intentional to change together. Side by side. Hand in hand. Over the years, that’s what Ted and I have sought to do. Yep, 13 years later, we’re still two different people with two different personalities. Because the truth is, marriage wouldn’t be quite as much fun (or perhaps as challenging at times either) if we were identical; if our personalities merged. But what changing, together, does mean is there’ll be less of a chance we’ll wake up one morning and wonder how we became strangers. 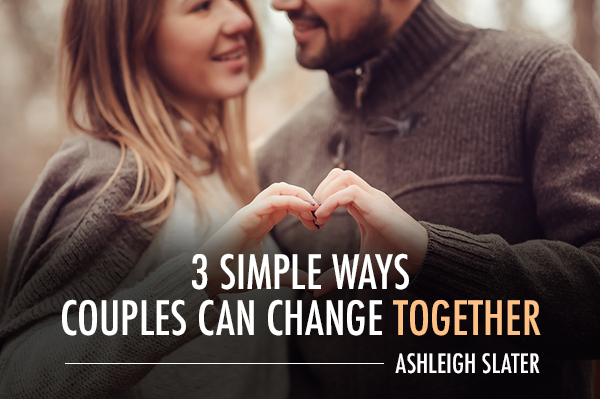 What are some practical ways you and your husband can be intentional to change together too? Here are three suggestions. Are you and your spouse on the same page when it comes to your hopes and dreams for the future? If you’re not sure, grab some paper and some pens and make a list. Jot down what you desire the next year to hold for you as an individual and as a couple. I recommend writing individual lists first. This allows both of you the freedom to be honest about your personal hopes. Next, come together and discuss your lists. What items are common? Which ones are unique? What are some practical ways you can work together to accomplish these things together? Pursuing shared activities means that you’re intentional to carve out time each day to do something with each other. Maybe you have coffee together in the morning. Perhaps it’s hitting the gym together or talking over dinner. Make a plan and start putting it into action this week. If you find that the shared activity you decide on doesn’t work after all, pick something else and give it another try. Seek out and develop new common interests. Discover new things you love to do together. Take the time to step out of your comfort zone and trying something your spouse likes. Sushi, classic movies, camping, or perhaps even Dragon Con. You might just discover you like it too. Who knew? I predict that 13 years from now, Ted won’t be the same Ted he is today. And I won’t be the same Ashleigh. Once again, we’ll have changed. But my hope is that we’ll have continued to change together. Side by side and hand in hand. A chapter or two later, our characters will change, the plot will develop, but we’ll still be co-starring in it together. The ebook version of Ashleigh’s book Team Us: Marriage Together is on sale for $3.99 from January 25 to February 14. Learn more about the book here. 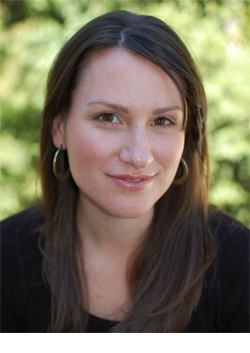 Ashleigh Slater is the author of the book, Team Us: Marriage Together, and a regular contributor at HuffPost Weddings, For the Family, and Start Marriage Right. With twenty years of writing experience, she loves to unite the power of a good story with practical application to encourage others. My Hubby and I made our marriage vows in July 1967 with problems from family unsupportive but wonderful friends and a dear sister who recently died of cancer. I was a midwife for 40 years, he was an Electrician who rose to be Power station Manager/ consultant in various countries around the world. We have tried to grow together but always a ‘satanic force’ seems to come between us, so that now he is anti my faith, anti my family and also most of my friends. He has ‘over the last couple of years retired’ and watched TV and reads the papers, which he seemingly believes explicidly! Loading venom of hate to God, churches and community charities, I have worked for!? My dear friends 2 who I continue to attend church with, Mothers Union ( although am a lone member) and Trefoil Guild. Doing Knitting for a project We started in 1980s and have continued while I traveling in Australia and overseas. Now he hits at the waste of’ unappreciated energy’ I give in Knitting these sets for special care babies of Teddies for trauma crews! Almost begrudging anything I do for others. Yes he has changed now from the Fighter of fires, Rescue crews, and First Aider of yesterday year to being almost sorry for himself. Paranoid of anyone stopping at our gate or coming to our place. Friends are no longer welcome to visit. However, in saying that he still rings and keeps in touch with our Children and certain grown Grandchildren whom he likes. Please I ask people reading this! It is not enough to try and Worship, grow together and live in Wedded life for almost 50 years but both Must have established Private interests and Hobbies, as well as your shared time. Yes, have dates for coffee, but share interests( a two way street) and maintain a community helping factor in all this!